A world first: a regimental history of a Roman legion. And it flows like a novel. Stephen Dando-Collins paints a vivid and definitive portrait of daily life in the Tenth Legion as he follows Caesar and his men along the blood-soaked fringes of the Empire. This unprecedented regimental history reveals countless previously unknown details about Roman military practices, Caesar's conduct as a commander and his relationships with officers and legionaries, and the daily routine and discipline of the legion. From penetrating insights into the mind of history's greatest general to a grunt's-eye view of the gruesome realities of war in the Classical Age, this unique and riveting true account sets a new standard of exellence and detail to which all authors of ancient military history now aspire. Following the example set by Robert Graves, author of I, Claudius and influential translator of Suetonius, in this work Dando-Collins uses modern military ranks for senior Roman officers, to make the work more accessible to the lay reader. Also, some time ago Dando-Collins formed the opinion that the 10th Legion formed by Caesar in Spain went on to become the 10th Fretensis, contrary to the opinion of 19th century German historian Theodor Mommsen, whose views had been accepted by classical scholars with limited legion knowledge but have been discredited by a number of modern authorities. For a detailed explanation of Dando-Collins' reasoning in this regard see the section on the 10th Fretensis Legion in his Legions of Rome. 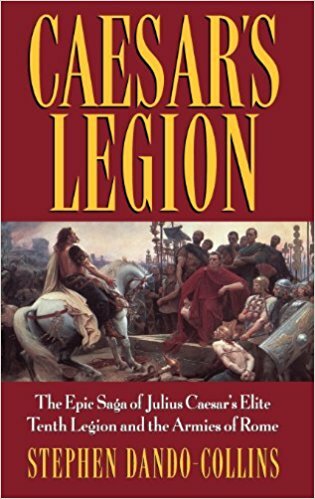 First published in the US by Wiley in 2002, the breakthrough Caesar's Legion, the first book ever devoted to the history of a single legion, has since been published in numerous editions and many languages worldwide and continues to attract avid readers internationally. AVAILABLE IN ENGLISH, ITALIAN, SPANISH, POLISH, PORTUGUESE, ALBANIAN, AND KOREAN EDITIONS, AND AUDIOBOOK. Caesar's Legion sponsored three more successful legion histories by Dando-Collins - Nero's Killing Machine, Cleopatra's Kidnappers, and Mark Antony's Heroes, and several more Roman histories with strong legion links - Blood of the Caesars, The Ides, and The Great Fire of Rome. These works led to Dando-Collins being commissioned by Quercus of the UK to write Legions of Rome, the first ever comprehensive history of all Rome's imperial legions in one book - for fans who often ask, available historical information on the republican legions is just too limited to allow him to cover them, too. The widely successful Legions of Rome has become the go-to guide on the legjons. You can read about all the above books on this website. In 2019, Stephen will be returning to Rome with his next US book, again for Wiley.